Hey everybody and welcome to this month's A Paper Pumpkin Thing Blog Hop! As always, a group of us Stampin' Up! demonstrators has come together to bring you a hop full of alternative card and project ideas for this month's Paper Pumpkin kit. 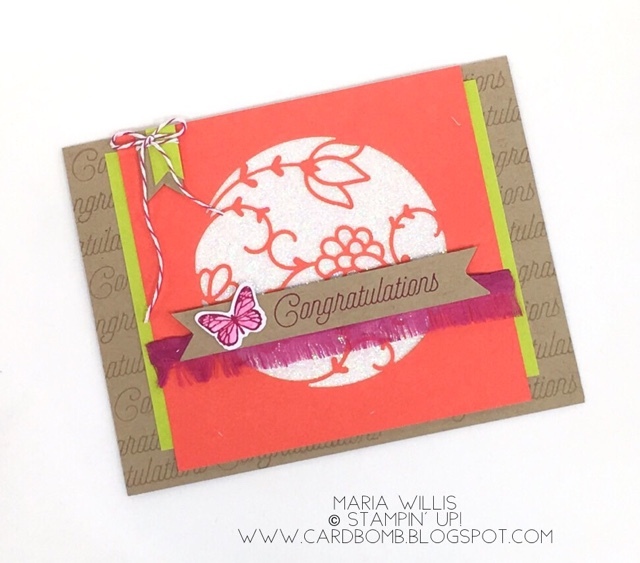 This month's kit is called Flora & Flutter and has some really fun die cut focal pieces. 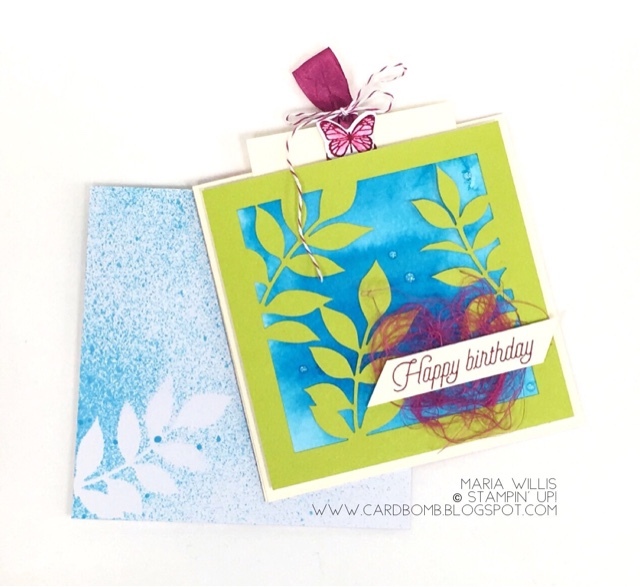 I have used one of those focal pieces on this card. Behind the Calypso Coral die cut with the beautiful, delicate flowers I have added a piece of Dazzling Diamonds glimmer paper which was also included in the kit. Actually, everything on this card came in the kit except for the Crumb Cake cardstock and ink, and, Clear Wink of Stella. I wanted to do something a little different with the embellishments that came with this kit so I created some little flags out of scraps and tied them with a bow. Then, after I stamped the butterfly I used my Clear Wink of Stella to stella color the inside of the butterfly giving it both color and shimmer (I did pick up some extra ink from the pad using my Stella brush). I also snipped off the edge of the Berry Burst ribbon and frayed it to get a fringed look. For my project I decided to make what could either be a gift card holder, or, a secret message holder... I also chose to add a Very Vanilla card base and some Pacific Point watercoloring to this project to change up the color scheme a bit. 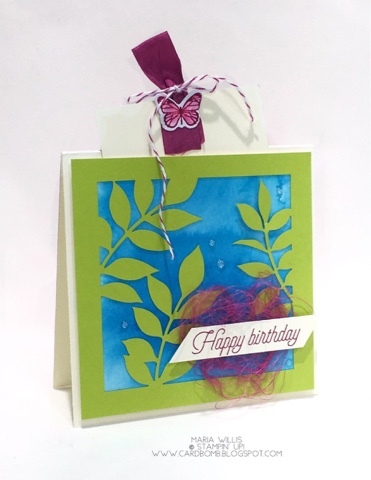 I also used the shredded ribbon that I had pulled from the ribbon in my card above as a background for my sentiment. I also couldn't resist adding some of these new embellishments from upcoming Occasions catalog (launching January 3rd, 2018). These are my favorite embellishments right because they are tiny and subtle. They make it really easy to add just the right touch without overdoing it. 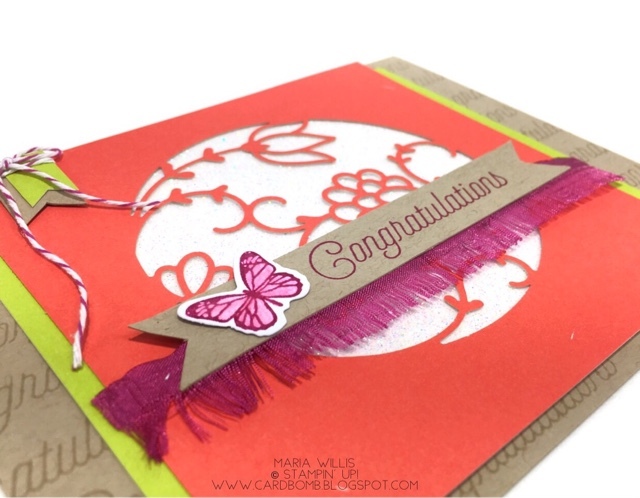 When you pull the ribbon at the top of card you reveal a secret hiding place. You could choose to adhere a gift card to this piece, or, you could write a special message. I also made a custom decorated envelop for this project. I used one of the leaves that I had cut out and placed it on top of the envelope. Then I used a spritzer filled with rubbing alcohol and Pacific Point re-inker to spritz over the top of it. When I lifted the leaves up they had left their mark so to say. I hope you have enjoyed my projects for today. Have you come up with any alternative ideas for this kit yet? If so, let me know what your ideas are in the comments below. 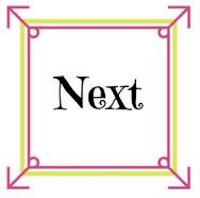 If you'd like to see some more great ideas just click the next button to head on over to my friend Andrea Tracy-Tucker's blog! She's sure to have something mind blowing to share! That's all for now. Have an amazing day and I'll be back tomorrow with some really exciting news! 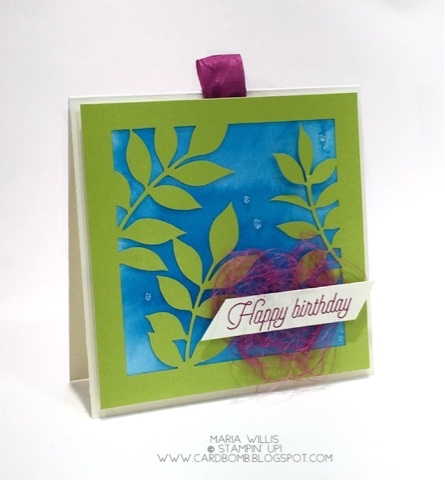 Awesome ideas, I love everything you make ;-) I wasn't thrilled about the epoxy drop embellishments when I first saw them, but they are perfect on that card. Thanks for sharing! Oh my goodness. I'm so excited about those embellishments! Any small and barely there embellishment makes me happy!